Sydney Road in Melbourne’s north is the city’s longest continuous shopping strip whilst simultaneously being one of Melbourne’s busiest transport corridors and a local activity precinct for the booming populations of Brunswick and Coburg. These different and competing roles that a main street plays for a city and a community can sometimes result in places that barely work for anyone. In the case of Sydney Road it is obvious that there is a need to make change. For cyclists, Sydney road is a very dangerous place with a highly level of very serious accidents from ‘doorings’ and other hazards. For those in cars Sydney Road is a stressful and frustrating drive as trams pedestrians and cyclists all attempt to use the road in large numbers. For those on public transport, trams are slow and unpredictable in their arrival time as they get stuck in traffic. In addition to the chaotic transport functions, Sydney Road itself is not a very attractive place to be. Whilst the quality of the boutique shops populating the street has been an attraction for people for a very long time, the street itself is making such visits less desirable. A lack of green infrastructure and vegetation is also having an effect on health through the urban heat island effect. During the summer month’s oppressive heat, the combined concrete and masonry fabric of the street results in higher temperatures, particularly overnight. These higher temperatures result in more cardiac arrests, more emergency services callouts and other adverse health system impacts on the community. With these challenges firmly in mind, Atelier Red+Black have teamed up with the Institute for Sensible Transport to develop a suite of design solutions to reinvigorate Sydney Road in order to make it a safer, healthier and more attractive place to be. From a transport perspective the key design aspects are facilitated through a reallocation of road space. 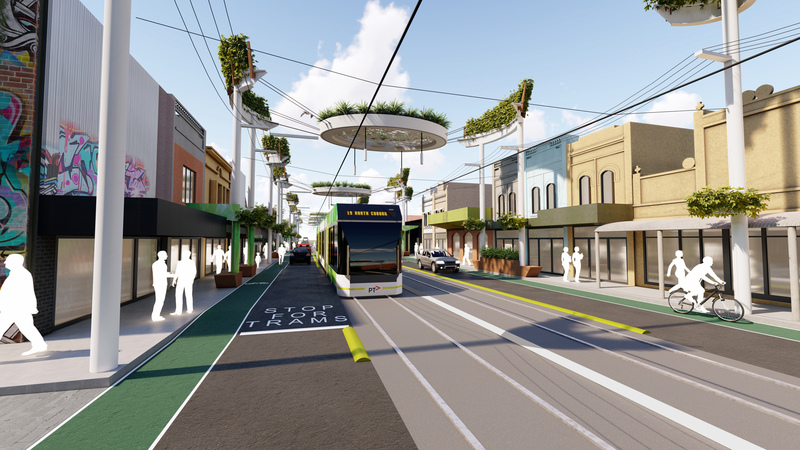 Under this design proposal trams will have their own dedicated road space, allowing them to provide a more reliable service. This will also allow for faster travel during peak times as trams will not be held up by traffic. Bicycles will also have their own dedicated lane, free from dooring risks and with hook turn lanes for turning right. Cars too will have their own lane making their journey less frustrating. This lane will have the speed limit reduced to 30 KPH in order to make it safer for pedestrians and cyclists. This also sends a strong signal that Sydney road is primarily for local vehicle traffic. 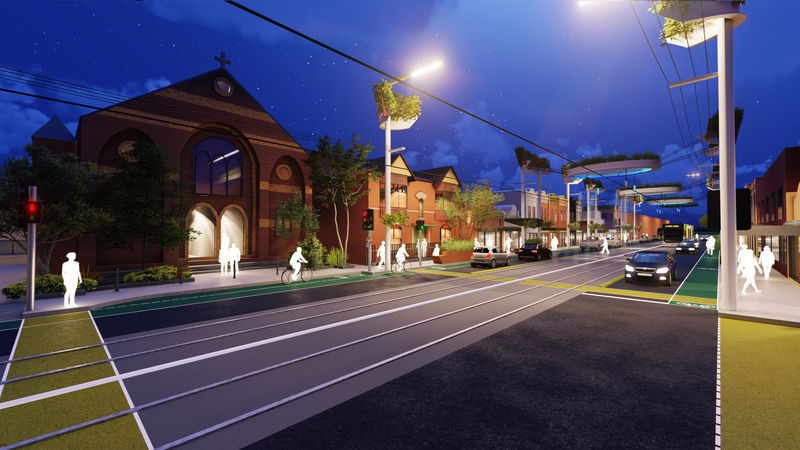 These modifications will enhance Sydney Road’s ability to move people in a variety of modes and safer for them to do so. There are also other benefits such as enabling faster response times for emergency services by allowing them to drive down the dedicated tram lane, further assisting the objective of a healthier place. 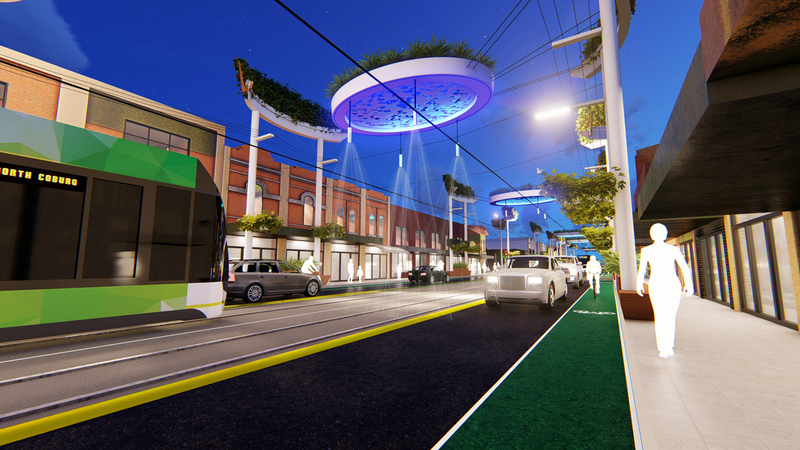 In addition to the re-balancing of the street transport function the Re-Imagining Sydney Road project sought out opportunities to add substantial additional vegetation and shading to what is otherwise a very harsh urban landscape. The benefits of street trees in urban streets is well known and ideally all streets would have a set of mature canopy trees. However with the intense transport requirements combined with a narrow street width Sydney Road has very limited opportunity for large mature trees. 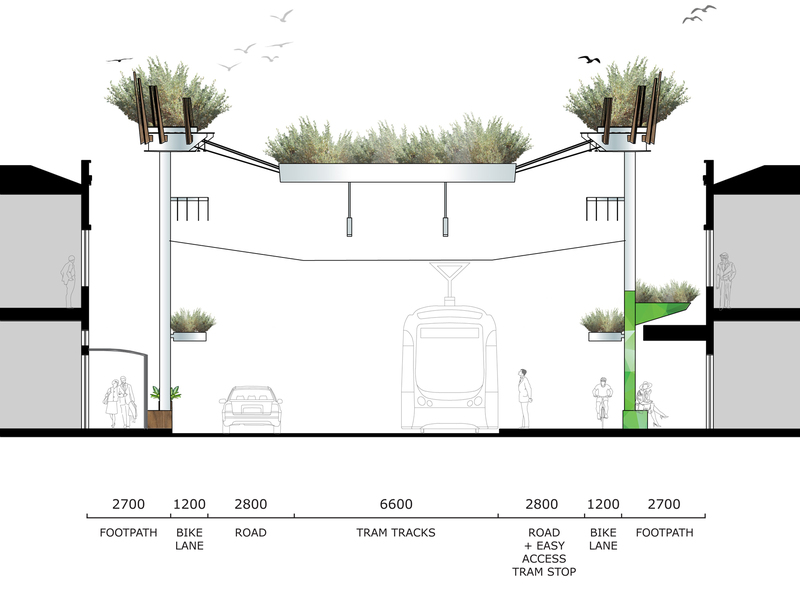 To counter this problem, the proposed design makes use of spaces above the tram lines, above street canopies and at ground level to provide planting opportunities. 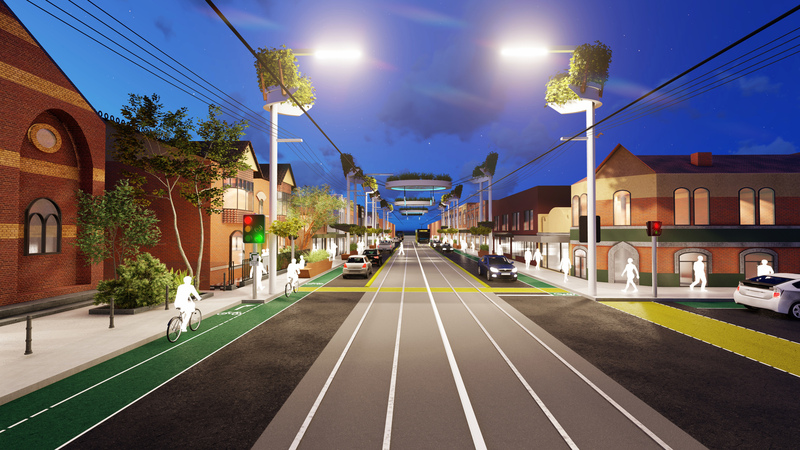 The existing street infrastructure that supports the electricity and phone supply, tram line supports, street lighting and signage are combined and additional spaces for green infrastructure are utilized. 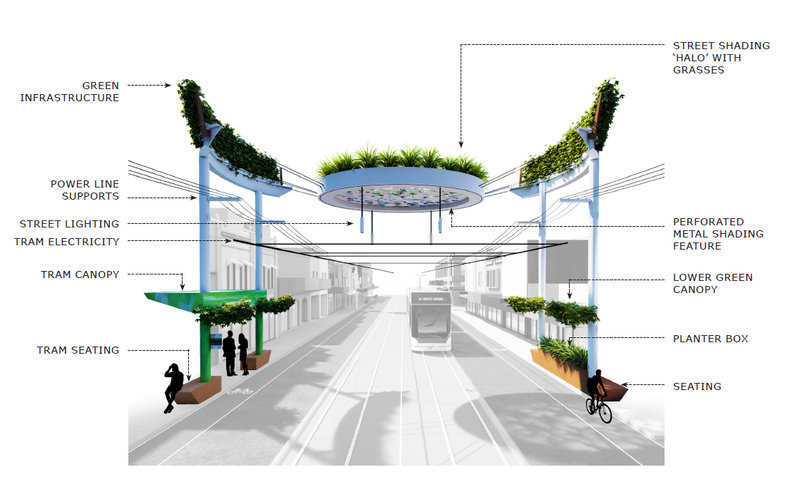 Most dramatically a series of rings are suspended above the street level to provide shading, greenery, lighting and a unique urban environment that is pleasant to visit and pass through. The modular system allows for the density of the shading to be moderated for different parts of Sydney Road simply by adjusting the spacing.